Homeowners with spare cash and a desire to help meet UK carbon emission targets have been through some tumultuous times. As with all new technologies, solar electricity needs financial assistance from the state, and how this is determined will change over time. In the early days, homeowners would be able to get a grant to cover up to half the 'up-front' costs of materials and installation, but wouldn't be able to earn anything for the electricity they produced. 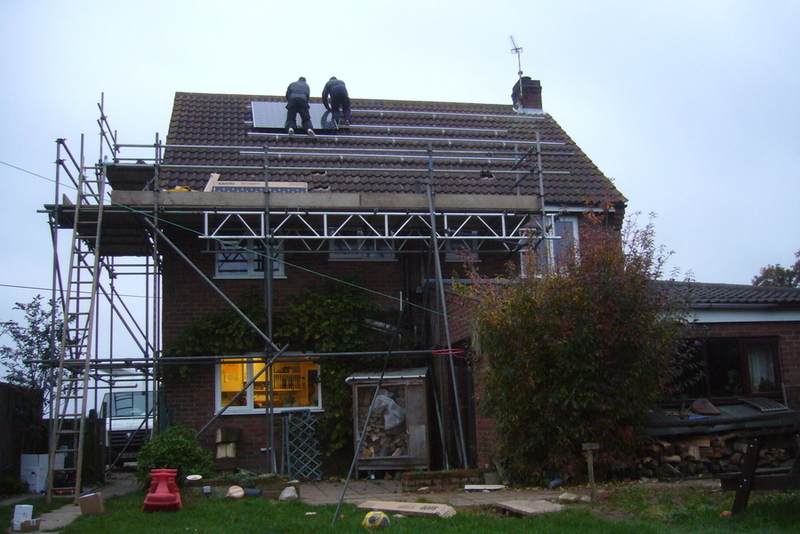 In April 2010, the Feed-in Tariff was introduced as a replacement to the initial-cost subsidy. This tariff was set at a level which would provide a decent return compared to simply keeping the money in the bank. The level was set at 41p per unit (index-linked, for a period of 25 years). This may seem high compared to the price that people pay for their electricity (around 12p per unit in 2010), but this is the sort of impetus needed to bring a new technology to mass-production and acceptance. The feed-in tarrif was due to be gradually reduced from April 2012, but in November 2011 the government announced that the rate would be halved for installations registered after the next month; totally unexpected and highly unfair for the infant solar pv industry that was starting to find its feet. A tussle in the courts forced the government to relax its decision, and a cut-off date of 3 March 2012 was announced by DECC (the Department for Energy and Climate Change). An additional concession, concerning home energy efficiency, also meant that just under half of the UK's housing stock would qualify (rather than the 9% previously demanded). As of mid-February 2012, anybody who tells you that they can get you a feed-in tariff of 43p per unit are either highly optimistic about their installation schedules or are kidding you. Once the 3 March deadline has passed, you will definitely only get the 21p per unit rate and will need to demonstrate that your home meets energy efficiency (band D) standards. Calculate how much your return on investment would be, at the new 21p rate. You can use our handy online solar spreadsheet if you like. Depending on your installation costs, and any costs in getting your home efficiency good enough, your 'break-even' point is around 15 years or more compared to a bank account. DECC has also published their own ROI guidance (PDF: Explanation of rate of return calculation for domestic PV), but it is quite hard to follow and leaves you wondering, "Is it really worth it?". One positive aspect of the FiT payment is that it is index-linked (RPI-based at the moment) so your payments should at least keep up with inflation. You still need to get quotes from installers; read about lots of people's experiences at our Compare Solar PV Installers page. You may be put off investing in solar panels if you think that you might move home in the next five or ten years. It is a valid concern, as you can't realistically take the panels with you when you move. You certainly can't take your panels with you and continue to claim your FiT on your new home, since that would class as a second-hand installation. Expect a higher sale price for your home since you can pass your FiT contract onto the new owner. This may put off some buyers, but others will look at it as a great way for the house to earn its keep. Continue to claim the FiT yourself by amending your property deeds to give you rights to access and maintain the panels. This will negatively impact the property price of course, and you will have to worry about insurance and legal costs (plus maintenance and decommissioning), but you get to keep the FiT payments for the length of your contract.